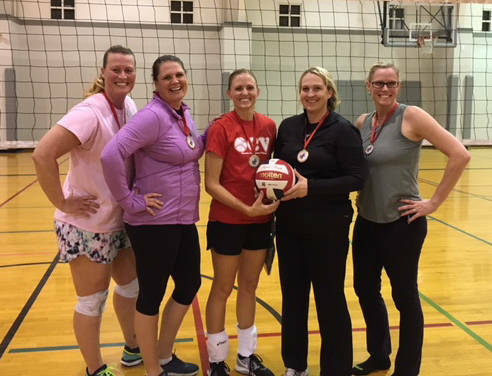 Kelly Lehr The champion Volleygirls, Kim Strong, Christel Stearman, Camis Higbee, Amber Caudell, and Danielle Ceci, were undefeated in Boulder City Parks and Recreation's women's volleyball league, which ended in mid-October. This week was the semifinal and final games for the Boulder City Parks and Recreation Department’s women’s volleyball double-elimination tournament. Synergy beat The Heavy Hitters in the semifinal game to advance to the final game. Volleygirls remained undefeated throughout the tournament, including the final game, where they won against Synergy 26-24 and 25-21, according to Kelly Lehr, sports coordinator for the department. The Volleygirls team members are Kim Strong, Christel Stearman, Camis Higbee, Amber Caudell and Danielle Ceci. In men’s softball, the Boulder Dam Credit Union team continues to dominate the league with a 9-1 record in the standings. Duetto and Pit Stop are tied for second at 7-5 with Mad Dogs close behind (6-4), followed by Ralph’s Tires (0-12). The double-elimination tournament will begin in mid-November at the ballfields at Hemenway Valley Park. The coed league has begun its second round of double-headers. Boulder Dam Credit Union is leading in this league as well with a 12-0 start, followed by Boulder Bowl (9-3) and Boulder Dam Brewery (8-4). Classy N Sassy (5-7) is coming up from behind with T.Q. Pallets (4-8), Boulder City Merchants (3-9) and Best Dam Crossfit (1-11) hosting some close scores in the past couple of games, Lehr said. Youth soccer has come to an end this week as Boulder City Parks and Recreation hosted 33 kindergarten through eighth-grade teams. Flag football begins next week and is played through early December. Games will be played at 6 and 7 p.m. on Mondays and Wednesdays at Pratt Field at Veterans’ Memorial Park, 1650 Buchanan Blvd.